On the 11th of December, a tsunami-like four metre high waves crashed through barriers and inundated homes in Kuala Terengganu, Malaysia. It happened at night around 8 pm local time. There was no obvious signs of storm or heavy down pour of rain as far as I am concerned. Now, a week later on the 17th of December, a similar event has happened in Philippines. Without any warnings, people were being flooded suddenly in the middle of the night at around 1 am. The official claimed that they have warned people about this storm. However, after browsing through the Internet, I could not find any official warnings declared before this disaster happened. The people didn't seem to know that a storm was developing in their area. Yet again, as far as I am concerned, there was no obvious signs of storm or heavy down pour of rain when the disaster strike. So far, 652 people were known to have died in the flooding and estimated that more than 800 more were missing. I am not convinced that these destructions were caused by the storm in Philippines. It sounds more like a Tsunami just like what happened in Malaysia. http://poleshift.ning.com/profiles/blogs/malaysia-we-thought-a-tsunami Your opinion is much appreciated. [and from another] Frantic Dash From Flood in the Middle of the Night [Dec 18] http://www.nytimes.com/2011/12/19/world/asia/in-philippines-fleeing-floodwaters-in-the-middle-of-night.html In neighborhoods throughout the cities of Iligan and Cagayan de Oro on the island of Mindanao in the southern Philippines, similar stories could be heard. Flash floods caused by Tropical Storm Washi surged into the homes of sleeping families, and hundreds were drowned or dragged to their deaths by the currents. The storm had followed an unusual path. Within minutes, the water was up to her hips. The family made it to the roof of a nearby house, and with the help of neighbors they swam from roof to roof, until they reached higher ground. [and from another] http://extremestormcentral.com/?p=1514 As of Saturday morning, eastern time, Washi was located over the Sulu Sea and was heading toward the island of Palawan. By later Saturday night or early Sunday morning, eastern time, Washi is expected to move over the South China Sea. [and from another] Village Taken by Surprise [Dec 13] http://www.nst.com.my/local/general/village-taken-by-surprise-1.18483#ixzz1gNf3Qg00 The four-metre-high waves, which came with the high tide at 8pm, took residents in the village by surprise. We thought a tsunami had struck as the water had rushed in so suddenly. The whole housing project was flooded and 196 victims from 41 families had to be evacuated to the village community hall. [and from another] http://www.zetatalk.com/newsletr/issue272.htm During these same days, not by coincidence, there were 10 foot high waves swamping a cruise ship in the Bangka Straits near Jakarta, a 12 foot high tsunami along coastal Kuala Terengganu on the Malay Peninsula, flooding along coastal Padang on the southern coast of Sumatra, and an 8 foot high wave wiping out a Viet Nam village. There has clearly been tsunami activity on the Sunda Plate of late, as noted by Nancy in her most recent newsletter. Not just the 12 foot tsunami in Kuala Terengganu, but 8 foot high waves in Viet Nam and near 10 foot waves swamping a ship near Jakarta. We predicted the possibility of tsunami activity, the 7 of 10 sinking, especially when the pace is rapid. Is this what happened in the Philippines? Yes and no. There are many factors afoot. A tropical storm was passing through, and it was also at a time of high tide. This was not due to sinking as the water came and went quickly, not lingering. 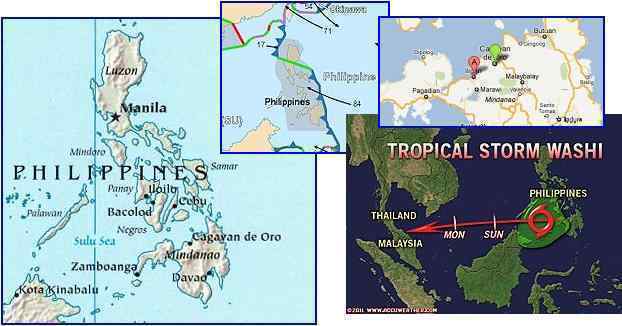 Nor is this portion of Mindanao expected to sustain sinking during the 7 of 10. But the primary influence was a tsunami type influx caused by the clash of water pouring in from the folding Philippine Plate. As the plate folds, the water must go elsewhere and one direction it disburses is through the island cluster just north of Mindanao. This time, however, these waters met the storm surge of Tropical Storm Washi, a clash which by momentum was carried over the north shore of Mindanao. Why is this tsunami activity occurring in the evenings or in the dead of night? There is a third factor afoot in the daily wobble, which not only pushes the globe under her waters but also jerks the globe to and fro so that plate movements occur. The Figure 8 formed above the N Pole takes a strong swing to and fro when the Sun is over the North Atlantic. This action forces the lands on the Sunda Plate to the east, suddenly, so eastern coastlines have a rush of water to deal with. A complicated scenario, especially given high tides and a folding Philippine Plate in the vicinity. I have several questions about transmigration. I've read some stories about the transmigration of the soul. They say some humans recall the memories of their preexistence. Some of the memories (they say some not all) show that, instead of humans, their preexisences are animals. I would like to ask that is this could be true? And if it's true, could a human, after his death, degenerate to be an animal as his next life? And if this is also possible, I have further questions, what causes this kind of switch? What is the reason of the degeneracy? Is this related to the spiritual density switch? Some religions, in particular the Hindu religion, speak of reincarnation into animals as a type of karma or punishment. One is human in this life, does badly, so next life will be a cockroach, for instance. The Hindu religion also presents the pole shift as the god Shiva, and the looming presence of the Dark Twin as Kali, one of his wives. Does this mean that Planet X (Nibiru) and the Dark Twin (which is a planet) are indeed these personifications? The message is delivered by many means, with Jesus using many allegories to get the meaning of the message across. A sparked soul incarnates the next time into a body that has consciousness and intelligence. This is overseen by the Birthing Guides and is not a choice of the young soul. Incarnations into animals not capable of sparking souls simply does not happen unless by a rare exception where due to a lesson or mission desired, both the soul and the Birthing Guides agree to a temporary incarnation into an animal. Nevertheless, there is great curiosity about such incarnations, a Shaman often attempting an out-of-body experience where he can become the creature, if only for a moment. Is this amazing cloud formation due to the Earth wobble or is it just a natural occurrence as described in the article? [and from another] http://news.yahoo.com/giant-tsunami-shape-clouds-roll-across-alabama-sky-192102289.html Experts say the clouds were pristine examples of "Kelvin-Helmholtz waves." 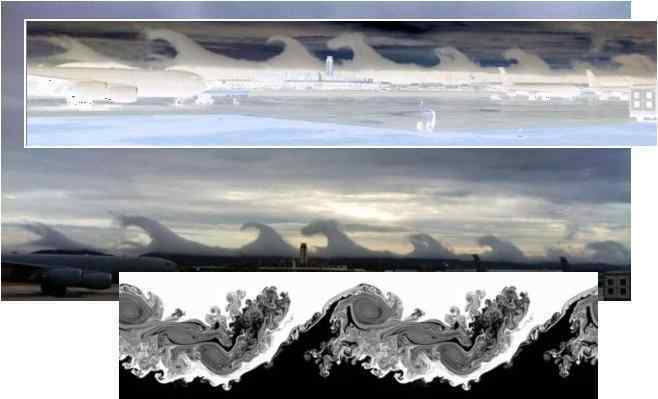 Whether seen in the sky or in the ocean, this type of turbulence always forms when a fast-moving layer of fluid slides on top of a slower, thicker layer, dragging its surface. [and from another] http://en.wikipedia.org/wiki/Kelvin%E2%80%93Helmholtz_instability One example is wind blowing over a water surface, where the wind causes the relative motion between the stratified layers (i.e., water and air). The instability will manifest itself in the form of waves being generated on the water surface. It matters not whether physics has a term for a cloud formation, or whether this occurs in nature in other fluid mediums. The question is, why now? As with other phenomena appearing during only the last few years - Moon halos, Sun halos, neon clouds, red dust sprinkled on the snow, monstrously large spider webs, flocks of birds dropping from the skies, unexplained rogue waves, and signing reservoirs - why now and not before? Of course this is wobble related. The technical Kelvin-Helmholtz description includes different speeds and different densities. Where natural where wind and water meet, air usually mixes more readily. The dramatic wave clouds require a layer of air more viscid, thick, which a radically lower temperature in the air would achieve. Higher humidity in the lower air layer would likewise be required, to form clouds when suddenly cooled. Likewise, the air layer moving over the top would need to be pushed quickly, which the wobble achieves. Air tends to move with the land, so the lower level clung to the land, while the upper level had velosity and was free to move. I wish to enquire about the difference in the height of the pole shift tsunami hitting the coast that faces the direction in which the landmass is moving during the pole shift compared to the height on the opposite side of the landmass? How will the movement of the UK during the pole shift hour affect the east coast of Ireland with the Irish sea in between? I see this as a general question for any country that will have another country moving behind it during the poleshift. I have calculated, as has one of the ZetaTalk members previously, that the landmasses will be moving about 2,000-4,000 miles per hour during the poleshift hour. What effect will this speed have on us during the poleshift? For those wondering if a land mass will protect a shoreline from the pole shift sloshing, or from the severe wobble sloshing, we have bad news. Water seeks its level, and will flow around islands or land masses buffering a particular shoreline, and do so quickly. In fact, such land masses or large islands will create roiling and clashing, increasing unpredictability. A flood tide flowing inland, unobstructed, will be even, steadily rising but without whirlpools or a sudden buildup. When flowing around an island or obstruction the water, coming head-on from both sides, will clash and roil, forming whirlpools and heaping high. We have predicted the flood tide during the hour of the pole shift to be 500 foot, with an additional 100 foot in height where tidal bore is expected due to the shape of the land. During the severe wobble, we have predicted the flood tide to be 200 and 300 foot respectively. In some parts of the globe such as Texas, where the ocean cannot disburse evenly, there will be increased bore height, as we have mentioned. Texas can anticipate a flood tide to 875 foot during the pole shift as a steady bore. But the islands of the UK, or of Indonesia or Japan or New Zealand, can expect roiling and whirlpools during flood tides. Pole shift or wobble tides can be expected to essentially mirror the initial tide on the rebound, just as the tides do today when caused by the Moon. The bulk of water on the move is essentially the same, and only diminishes gradually after several back and forth sloshes. Were the Moon to disappear after pulling a tide up onto a shore, the reverse tide would be the same due to the bulk of water falling back, but over perhaps 4-6 tides back and forth the tide would cease entirely. In similar manner, the pole shift tides will diminish. Severe wobble tides will continue full force during the severe wobble, with similar tides at other times during the Last Weeks as the Earth contorts her position. I have noticed this week that CNN mentioned that flooding had occurred before the storm hit the Philippines and in the subsequent news story they mentioned the migrant ship from Indonesia sinking near the coast of Australia. Is there a change of opinion at CNN because it sounds likes they are not only backing up your predictions but also trying to put emphasis on them? [and from another] Refugee Ship Drifts in Political Stalemate [Aug 29, 2001] http://articles.cnn.com/2001-08-29/world/aust.ship.piracy_1 Australia has refused to allow the Tampa to dock since the container ship rescued the asylum seekers on Sunday from their sinking Indonesian fishing boat. The ship is still in Australian waters, floating five nautical miles off the coast of Christmas Island, an Australian territory 217 miles south of Indonesia. [and from another] Tropical Storm Washi Drenching the Philippines [Dec 17, 2011; 4:42 AM ET] http://www.accuweather.com/en/weather-news/tropical-storm-washi-drenching-1/59136 Tropical Storm Washi has already begun to unleash heavy rainfall on the southern Philippines, and more is on the way. Support for the ZetaTalk message within the media has come from unexpected sources at times. Glen Beck of Murdoch's Fox News network preached a survivalist mentality in 2010, for instance. There have been other surprises, with the History Channel featuring the truth about UFOs and the alien presence, while the Discovery Channel stays firmly with the coverup. But when the accuracy of the ZetaTalk predictions can no longer be denied and the common man is increasingly finding the ZetaTalk message via the Internet, what then? Nancy will tell you that from the start of the ZetaTalk saga in 1995, she has joked about the time when the CNN truck would come down the street. Sleeper cells may awaken! Recent increases in zero-visibility fog and "smoggy weather" have sometimes severely affected air and ground travel in China and India. These unusual conditions are blamed on weather, man-made pollution, or a combination thereof. Is there more than the eye can see to explain these phenomena? For example, is dust from the tail and/or Planet X Complex an unstated, contributing factor? [and from another] Traffic Crippled as Dense Smog Continues to Shroud Parts of China http://news.xinhuanet.com/english2010/china/2011-12/06/c_131290816.htm In east China's Shandong province, about 10 expressways have been forced to shut down. [and from another] What's Behind Delhi's Fogged In Flights? http://india.blogs.nytimes.com/2011/12/21/whats-behind-delhis-fogged-in-flights/?ref=world So when did the fog in Delhi get this bad? Analysts say the turning point was 1997. A cocktail of factors contributed: a shift in the land-use patterns, increased pollution, and more moisture due to irrigation. In Delhi, it can last for 20 to 25 days. Mr. Jenamani said Delhi is hard hit because of the city's geographic location, the open space at the airport, and the prevalent wind patterns. If the increased violence of the Earth wobble can be bringing back to back hurricanes to the North Sea, and creating a tsunami tide over Mindanao, then can it churn up the air masses over India and China? The great Himalyasa create a block to these vertical air flows caused by the wobble, so humidity and pollution cannot escape as they did formerly. Earth Must Have Another Moon, Say Astronomers http://www.technologyreview.com/blog/arxiv/27425/ A study of the way our planet temporarily captures asteroids suggests that Earth should have at least one extra moon at any one time [and from another] The population of natural Earth satellites [Dec 16] http://arxiv.org/abs/1112.3781 At any given time there should be at least one NES of 1-meter diameter orbiting the Earth. [and from another] Earth Has Always Had Two Moons! http://www.hindustantimes.com/HTNext/LifeAndUniverse/Earth-has-always-had-two-moons/ In the new study, astrophysicists at Cornell claim that this little moon was not an anomaly as these asteroids come and go so often it means our planet always has a temporary second moon. [and from another] http://weeklyworldnews.com/headlines/21481/earths-second-moon-appears/ Residents of this small Australian town were shocked to see two full moons in sky! How does a seemingly innocent astrophysics article about tiny asteroids sharing the Moon's orbit go viral and appear on spoof sites showing two Moons in the sky along with a two-headed baby? The astrophysics article states that debris or tiny asteroids, no more than a meter in diameter, have been found sharing the Moon's orbit on occasion. But the headlines scream two moons. This is a trend encouraged by those who would confuse the public about the presence of Planet X until the last minute. They hope to confuse the public, for whom they have great distain, assuming that no more than a headline would be read by the poor dumb working brutes the elite consider their slave class. More than the Second Sun (caused by sunlight bouncing off the dust cloud closely shrouding Planet X) has appeared in the skies. The Monster persona has likewise appeared. (This is where light rays heading away from Planet X or its Moon Swirls or from the Dark Twin are bent back toward Earth by Earth's gravity, thus giving the appearance that the source of the light is huge, a Monster). Yes, as large as the Moon, perhaps. The clue that this is a disinformation campaign lies in the multitude of sources for this disinformation, all publishing a confusing headline, all claiming two moons in the headline. This is not a coincidence. This is a deliberate campaign.